It’s the best event in this Christmas to get together with your friends and celebrate our lasting love for all that’s Granary rock. Go crazy to the classic rock tracks that you just want to hear once again brought to you by the original Granary DJs. 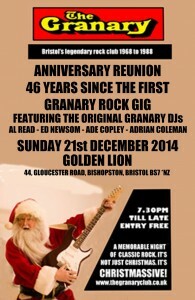 Make arrangements now to meet up with your rockin’ mates at the Lion on the 21st and do it like we did at the Granary rock disco. Memories will be revived of nights in denim and Black Sabbath t-shirts, sticky bar carpets and questionable toilet arrangements! The Granary was great and the reunions have a reputation of being as close as it can be to the original. We want to see you there, don’t let us down! 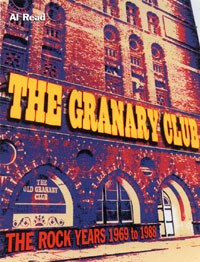 Nearly 1,500 copies of the Granary book have been sold and it is now not available in your local friendly book shop. However there are copies for you to purchase as rocking good presents for Christmas at our reunion on 21st December at the Lion. Not only is the book priced at less than half of its original retail price but also the original Granary DJs are there to sign the book to make it a special gift for someone. Our last newsletter brought you the human story of despair as Al mourned the loss of the film that featured the group East of Eden back in the dim past of 1968. Al sang in the band whilst Granary DJ Ed was roadie. Many years of trying to track down a copy failed leaving both the Granary guys bereft with no evidence of this highlight in the progressive rock time of their life. After our last newsletter where the missing film was featured we received several helful leads to the existence of a copy of an original VHS of the film. Afew weeks later a DVD turned up from our friend Piotr in Poland who had obtained one of the copies from the USA. Al has now seen the film and was suprised to see that the part where he showed his acting skills when he had to halt the playing of the band to point out that the venue was on fire had been editted out!